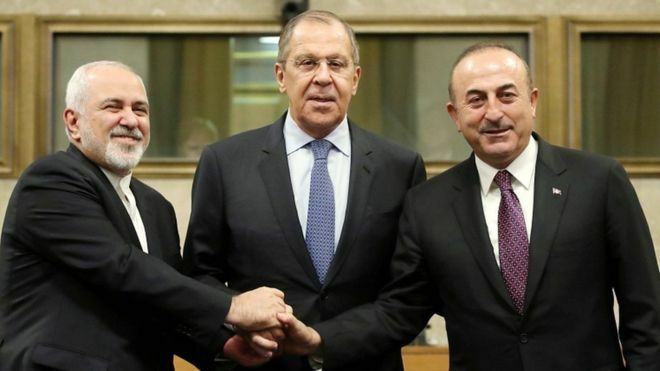 Russia, Turkey, and Iran have failed to reach agreement on the composition of a constitutional committee to help resolve Syria’s 93-month conflict. The foreign ministers of the three countries, meeting in Geneva, signed an agreement in principle for a committee leading to “a viable and lasting Syrian-owned, Syrian-led, UN-facilitated political process”. But they failed to conclude the make-up of the 150-strong committee — 50 members each from the Assad regime, the opposition, and civil society and “independent” groups — with diplomats saying Russian Foreign Minister Sergey Lavrov had objected to five names. UN envoy Staffan de Mistura, who has pursued the committee since January and is quitting at the end of December, was absent from the gathering. I believe there is an extra mile to go in the marathon effort to ensure the necessary package for a credible, balanced and inclusive constitutional committee, and for including a balanced chairing arrangement and drafting body and voting threshold — to be established under UN auspices in Geneva. The Assad regime has long objected to proposed members from the civil society and “independent” groups.